Jaipur : Incense stick manufacturer, Cycle Pure Agarbathies, today announced its aggressive growth plans for the state of Rajasthan. As part of the scaling up strategy, Cycle Pure Agarbathies plans to double its market penetration across the state in the coming 6-7 months. The company has also signed Bollywood megastar Amitabh Bachchan as the brand ambassador. The Bollywood icon will endorse the new brand positioning “Prarthana ki shuddhata (Purity of Prayer)” across a multitude of media vehicles nationally. 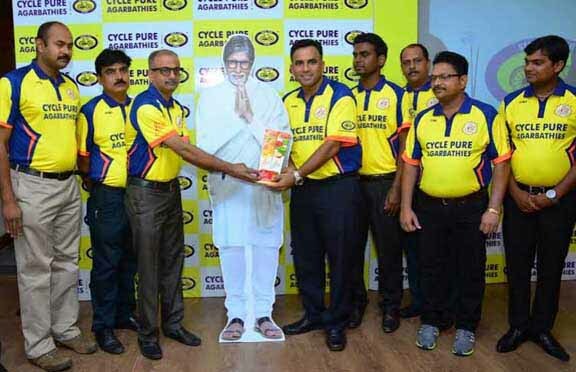 The occasion was also marked by Cycle Pure Agarbathies launching its new range of Lia Agarbathies. Created and blended in-house, the collection comes in 6 different fragrances namely- Lia Crème, Lia Lavenderz, Lia Citric tango, Lia Lilium, Lia Floress and Lia Applee. Elaborating on the expansion plans, Arjun Ranga, Managing Director, Cycle Pure Agarbathies, said, “At Cycle Pure Agarbathies, we constantly strive to ensure utmost customer satisfaction by offering them a wide range of choice with high quality products, and exquisite fragrances." Centered on the theme of purity, the new campaign has been conceptualized by DDB Mudra. The television commercial is produced by Rising Sun Films and directed by Shoojit Sircar, of “Piku” fame. The television commercial will be supported by radio spots and direct outreach programmes across the country. The company has also planned an innovative dealers’ engagement programme. Named Meeting of the Legends, the event will offer the growing retail network of Cycle Pure Agarabthies an opportunity to witness, comprehend and participate in Cycle’s journey of growth. First of its kind, covering the length and breadth of the country, the programme will offer Cycle family the chance to witness the grandeur of the Bollywod icon up-close. It uses the 3D holographic projection technique similar to Narendra Modi’s campaign in 2014 Bi Elections, to launch and interact with Amitabh Bachchan.